Human excellence in virtually all domains is guided by mental factors. The experiences of exceptional performers suggest that there are seven critical elements of excellence: Commitment, Belief, Full Focus, Positive Images, Mental Readiness, Distraction Control and Constructive Evaluation. These elements combine to form a "Wheel of Excellence" that provides a working framework to guide the pursuit of excellence. Each of the seven elements of excellence is discussed and suggestions are made for application in practical performance enhancement situations. Quotes from great performers illustrate each element. What enables you to become great at what you do? What allows you to perform at the highest levels of excellence? For twenty five years I have worked as a mental training consultant with great performers in many different pursuits. I have learned from thousands of hours of individual interviews, careful observations, and extensive two-way interactions with athletes, coaches, and performers in a variety of settings. My interaction with some athletes who became the best in the world began when they were in their developmental stages, continued through their entire sporting careers, and included their transition to other meaningful pursuits .I have also learned important lessons about excellence from a series of in-depth interview studies investigating the mental qualities of exceptional performers in sport and other high performance domains. Most of these studies were conducted in collaboration with my graduate students at the University of Ottawa. Everything I do, whether it is weights, or running, or the normal training things, or the leisure activities I do, is all geared toward how it's going to affect my performance. Everything is opportunity/cost. If I go out to a movie instead of going hiking as my leisure activity, what is the cost of that? If I go to the movies instead of a hike, does that help or hurt my performance. I've got to judge that. I've always thought this way. I have always dreamed about being the best in the world. Maybe that's different from other people. ( Larry Cain - Olympic Champion - Canoeing) It's committed through the ups and downs. Committed through the good results and the bad results, when you're coming in 50th and it looks like there's never an end to the bad results. To excel at the highest level, commitment moves to the point at which the pursuit itself becomes the center of your life, at least for certain extended periods of time while you are engaged in preparation and performances. The world's best performers carry an extremely high level of commitment or passion for their pursuit. This is required to attain the highest levels of excellence. For consistent high level performance you must commit not only to high quality training and maximum performance, but also to adequate recovery. Allowing enough time for physical and mental regeneration is a critical part of high quality performance. You must learn to "train smart" and listen to your own body. You must respect your basic needs for relaxation, rest, regeneration, sleep, good nutrition and joyful moments away from your performance domain. If your needs for rest and regeneration are not respected, you are susceptible to over-training, loss of focus, inconsistent performance, chronic fatigue, irritability, illness, and injury. What you do away from the performance arena has a tremendous effect on what you do in the performance arena. People rarely begin sport or other high performance pursuits with total belief in their capacity to execute tasks with precision. You often do not know what you are capable of doing. Rookie surgeons in an operating theater and rookie athletes in a competition arena acquire belief through experiences in the performance and practice arena from which they learn and grow. Belief is strengthened by experiencing improvement and success, learning from others, receiving positive, constructive feedback, and feeling the support of others. Belief is further strengthened by developing essential mental skills associated with excellence. Each of these mental skills serves to enhance the quality of preparation and the consistency of your performance in "the arena," all of which enhance belief. As mental skills are strengthened, confidence is strengthened and commitment is enhanced. 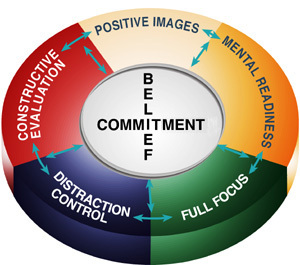 As commitment rises, you often act in ways that further enhance your belief and the level of your performance. Your skill at focusing affects your rate of learning as well as the quality of learning, practice, preparation, and performance. Your ability to direct and control your focus also affects your level of activation and relaxation. You control the volume, intensity, direction and persistence of your actions and reactions through your focus. To perform effectively, especially in situations that count, a refined ability to focus fully on the right things (i.e. the things that "work" for you) is essential. The single most important mental goal for the successful execution of all performances is to train your mind and body to the point that you can connect fully for the duration of your performance. Focus in the present, in "the here and now" for the duration of the action-oriented part of your performance. During breaks in the action or when you are away from the performance arena, take advantage of opportunities for "mental time outs." A simple positive shift in focus to something less demanding or more relaxing can allow you to relax and return with an effective performance focus. The specific nature of your pursuit and your personal history will dictate the content of your imagery and the extent to which you draw upon different senses. However, those who attain the highest levels of excellence experience clear, positive, process-oriented performance images as real "feelings" in their mind/body. The world's best performers (e.g. athletes, surgeons, astronauts, and classical musicians) have highly developed imagery skills that they use daily They draw upon these skills to: prepare themselves for high quality performances, recall and refine technical skills, make corrections, relax, experience themselves as successful and in control, regain control when struggling, set a positive frame of mind and create a high quality focus. The most striking finding in our series of interview studies with people who excel in different pursuits was the extent to which they had similar mental skills and perspectives. Exceptional Japanese athletes, all of whom were Olympic or World Champions, had performance perspectives and mental skills that were very similar to exceptional athletes in Canada and the United States. Exceptional surgeons and astronauts in North America had performance perspectives and mental strengths similar to exceptional classical musicians in Europe. There are individual differences with respect to how these mental skills are combined, utilized, and orchestrated, but the Wheel of Excellence is evident in virtually all of the most exceptional performers. Some may utilize certain components more than others, and some may be more spontaneous or more systematic in their preparation and application of these skills. For example, top classical musicians found spontaneity, flexibility and creativity to be an important factor in their mental readiness to perform. Some performers may need to focus more on mentally preparing themselves to "read" and react quickly. This is true for individuals in team sports, combative sports and others facing situations that demand quick, accurate responses to changing situations. Appropriate action and reactions in these pursuits is led by thorough mental preparation and trust in your ability to react automatically. The Wheel of Excellence can serve as a guide in your own pursuit of personal excellence. Decide where you are strong and where you need strengthening. Target areas for personal improvement and work at it. Coach Doron has questions for you regarding this article. Make sure you send him an email if you have not received instructions on answering these questions. levleva, L. & Orlick, T. (1991). Mental links to enhanced healing: An exploratory story. The Sport Psychologist 5, 512-520. Imai, K. & Orlick, T. (1995). An examination of mental factors associated with excellence in exceptional Japanese athletes. Unpublished study. University of Ottawa. Lynch, J. (1984). Better running commitment: What you give is what you get. The Runner.. Dec. pp.21,22. Kreiner-Phillips, K. & Orlick, T. (1992).. Winning after winning: The psychology of ongoing excellence. The Sport Psychologist, 7, 31-48. McDonald, J. & Orlick, T. (1994). Excellence in surgery: Psychological considerations. Contemporary Thought on Performance Enhancement, 3, 13-32. McDonald, J., Orlick, T. and Letts, M. (1995). Mental readiness in surgeons and its links to performance excellence in surgery. Journal of Pediatric Orthopedics, 15,5:691-697. Orlick, T. (1986). Psyching for sport: Mental training for athletes. Champaign, IL. : Human Kinetics Publishers. Orlick, T. (1989). Reflections on sportpsych consulting with individual and team sport athletes at summer and winter Olympic games. The Sport Psychologist 3, 358-365. Orlick, T. (1990). In pursuit of excellence. (2nd Edition). Champaign, IL. : Human Kinetics Publishers. Orlick, T. (1992). The psychology of personal excellence. Contemporary Thought on Performance Enhancement, 1,109-122. Orlick, T. (l998) Embracing your potential. Champaign, IL. : Human Kinetics Publishers. Orlick, T. (1998). Feeling great: Teaching children to excel at living. Carp, ON. : Creative Bound. Orlick, T. (1995). Nice on My Feelings: Nurturing the best in children and parents. Carp, ON. : Creative Bound. Orlick, T. & Partington, J. (1986). Psyched: Inner views of winning. Ottawa: Coaching Association of Canada. Orlick, T. & Partington, J. (1988). Mental links to excellence. The Sport Psychologist, 2,105-130. Partington, J. & Orlick, T (1991). An analysis of Olympic sport psychology consultants' best-ever consulting experiences. The Sport Psychologist, 5,183-193. Partington, J. (1995). Making music. Ottawa: Carleton University Press. Sprung, H. & Orlick, T. (1995). Mental strategies of astronauts. Unpublished study, University of Ottawa.